Please accept my humble obeisances in the shade of your divine lotus feet. My heart is parched and dry, devoid of genuine devotional sentiments. Still I shall try to serve Your Divine Grace on this auspicious day of your appearance by offering this small poem. But he didn’t say how we’d get our spiritual forms back. Upon souls He releases from maya’s false show. Through your pure teachings, these spiritual forms we can see. You cultivate pure forms, which Lord Krsna will harvest. Maijaris (means “blossoms”) for the Divine Cowherd Boy. There’s so many soul-seeds, and Kali-yuga’s so rocky. Help me take out these stones, Prabhu sow these seeds over here. Pour the Prabhupada-vani nectar right into their ears. O Prabhupada, please help me, I’m feeling so weak. This work is so hard, I’m in need of a break! If I think this work’s material, I’ve got rocks in my head. That I tend my own heart, lest I again become impure. If I stumble, Srila Prabhupada, please bless me with a shout! 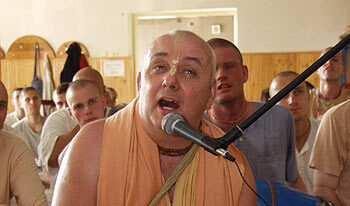 Always chant Hare Krsna in great ecstasy. We’ll all go back to Godhead, Prabhu, just wait and see! Syamasundara Sri Krsna, of most beautiful hue.